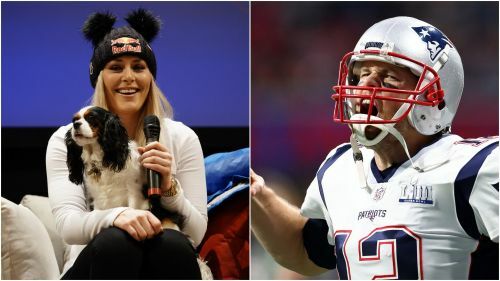 Lindsey Vonn is philosophical about failing to break the record for overall FIS Alpine Skiing World Cup wins saying "not everyone can be Tom Brady and keep winning the Super Bowl for the millionth time". American great Vonn crashed out of the penultimate race of her career at the FIS Alpine World Ski Championships in Tuesday's super-G race in Are, but still plans to take the slopes for one last time in the downhill on Sunday. Vonn, who confirmed she still requires an operation after tearing her lateral collateral ligament in her left knee while training in November, had targeted beating Ingemar Stenmark's overall record of 86 World Cup wins before hanging up the skis. However, the 34-year-old, who has 82 victories in a career that has been blighted by injuries in recent years, will fall short of the mark. But Vonn has no regrets and remarked that not all athletes can be like Brady, who won a record sixth Super Bowl ring with the New England Patriots in Sunday's beating of the Los Angeles Rams at the age of 41. "Not everyone can be Tom Brady and keep winning the Super Bowl like for the millionth time," she said of the veteran quarterback. "I've done my best my entire career. I've come back from way too many injuries and I'm not able to do it and that's just life. "I think 82 wins is still something to be really proud of and while it's not 87 … I think if you look at all the injuries I've had, I think it's really something amazing and I'm proud of it, no matter that I got 82 or 87. "I wish I could have got it, but not at the risk of the rest of my life." Vonn also joked on Twitter about her latest setback: "If adversity makes you stronger I think I'm the Hulk at this point..."